Fighting out of the red corner, the Bordeaux Bruiser…Eric Druon (Baronsat) and his “NAVETTE ULYSSE 31“. And fighting out of the blue corner, from Nazareth Belgium….BeLgIuM ww2 bUiLdeR and his “sdkfz“. As usual, constant reader, you are tasked with deciding the outcome of this pugilistic endeavor by way of comment. On the last edition of Friday Night Fights The Suboken Project gave his opponent a savage beating to the tune of a 9-0 victory, causing many in the fight community to wonder if the matchmaker has lost his wits. Only time will tell, tune in next week for more action! sdkfz (how do you pronounce that anyway?). Definitely. I don’t even know what the Navette Ulysse is–it looks like a jet-train-starfighter, but I love it all the more for its mystery. Well made as the sdkfz is, I have to give the win to the Baron. 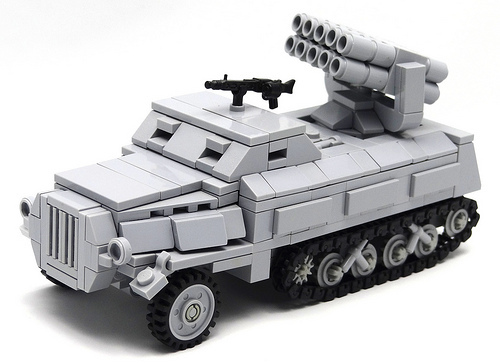 At first, the solid looking design and build of “sdkfz” had me leaning toward’s the Blue corner. However, after a closer examination of “NAVETTE ULYSSE 31“, I’m seeing a nostalgic call back to 60’s and 70’s Japanese Sci-Fi and TV shows like Thunderbirds. Red corner steals my vote. This week, my money is on the blue corner. Ulysses 31 was a show that captivated me as a child, although it wasn’t until about a year ago that I was able to find out what I had been watching (And finish watching it). 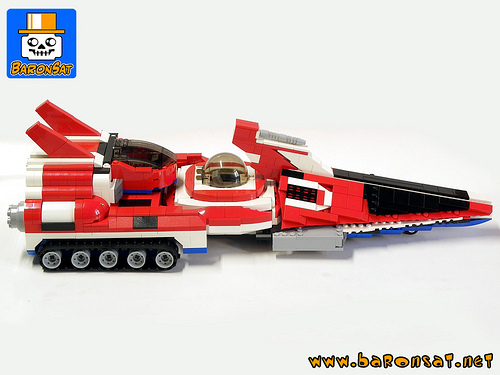 The red corner has brought a tremendous rendition of the Astronave vehicle(s) from that show (Although in the builder’s country, the show was called “Ulysse 31” and the transforming vehicle was the “Navette”), which transforms and everything! Super cool. Red corner has my vote! Sdkfz is the winner to me. As a big fan of the ’80’s cartoon, and as a proud owner of an original Popy Ulysse 31 Navette toy, my vote was cast as soon as I saw this. It’s a perfect recreation of a wonderfully exciting toy. Sdkfz. The economy of parts is astounding to me.